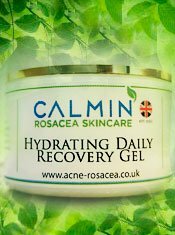 Home / Uncategorised / CALMIN Rosacea Ultra Mild Cleanser 200g – 30 DAY REFUND – It is essential to cleanse without further irritation. 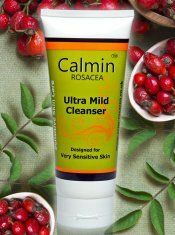 CALMIN Rosacea Ultra Mild Cleanser 200g – 30 DAY REFUND – It is essential to cleanse without further irritation. Effective make up and every day pollutant remover, clearing impurities that can easily irritate Rosacea prone skin. Either use as a Rinse off cleanser or wipe off with Cotton Wool for those who cannot even tolerate tap water. With Rose Hip Oil and Bisabol (from Chamomile). Hypo-allergenic. With Rose Hip Oil and Bisabol (from Chamomile). Qualifies for our 30 day No Quibble Money Back Refund. Aqua, Ethylhexyl Palmitate .Glycerin ,Polysorbate 20 ,Rosa Canina Fruit Oil, Sucrose Distearate, Sucrose Stearate, Bisabolol, Allantoin, Carbomer, Triethanolamine, Dehydroacetic Acid, Benzyl alcohol.